Winter is just around the corner and we all know that does to our hair – STATIC. DRYNESS. DULLNESS. UGH. Tackling static is one thing but in combination with winter accessories like hats, scarves, and coats, it’s a lot to consider. Or you know when it gets too warm indoors and you go to pull your sweater off over your head and whoosh, static mayhem, hairs flying everywhere for the rest of the day, sticking to your face and making it impossible to focus. WHY DOES STATIC HAPPEN IN HAIR? To help me with this question, I tapped into Pantene’s Principal Scientist, Dr. Jeni Thomas who told me that static is caused by lack of moisture - low humidity from indoor heating and harsh winter weather outdoors. She also explains, “Proteins in our hair fibers give hair a natural charge, but this charge is dissipated by hair’s internal moisture. When it’s cold outside or with electric indoor heating, humidity levels are exceptionally low – our hair tries to match those levels, which means it becomes stripped of static-blocking moisture. 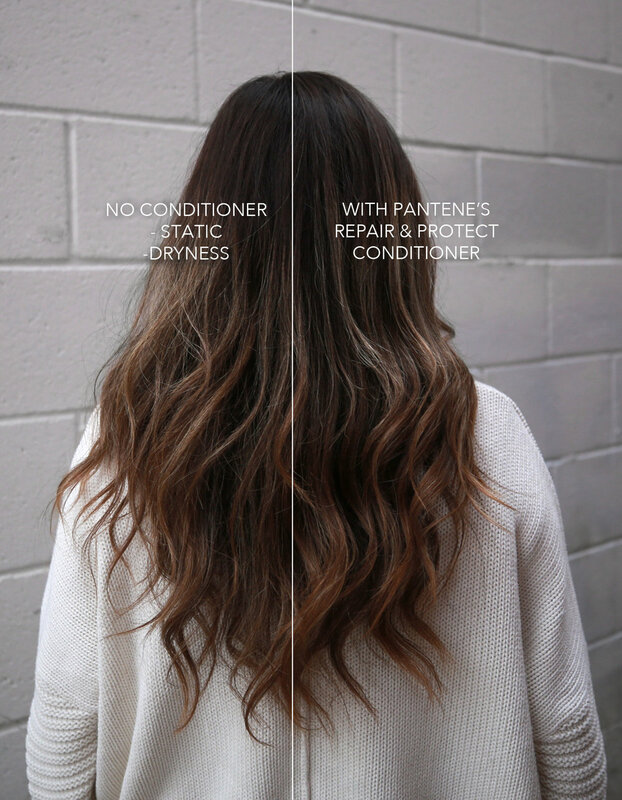 Conditioners like the Repair & Protect collection from Pantene help keep static away thanks to the micro-moisturizers in the formula that hydrate every strand. “Pantene conditioners are formulated by carefully balancing moisturizing ingredients that regulate the hydration levels of hair and penetrate each layer of the hair fiber” says Dr. Jeni Thomas. Here’s to healthy, static-free hair this winter! WHY DOES MY HAIR LOOK DULL IN WINTER? Hair can look dull when there’s damage along the shaft and it doesn’t reflect the light on the strands. Pantene’s conditioners features “smart-technology” that targets the damaged parts of the hair. Since I’ve been growing out my hair I’ve found that I not only tuck it into coats, but sweaters, AND it’s constantly getting caught on the shoulder strap of my handbag. I kid you not, the damage is evident when I condition with something other than Pantene (look I have two bathrooms and right now only one of them is stocked with Pantene and the other one has a $30 bougie conditioner and shampoo that leaves my hair looking lack luster and frayed.) What can I say? Pantene is where it’s at. Disclaimer: This post is sponsored by Pantene. All photos and opinions are my own.